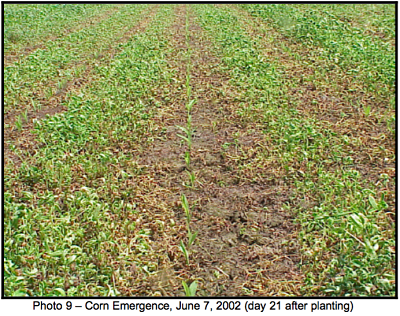 Recent research (Albrecht et al., 1998, 1999) has developed a promising new system for situations where erosion is a problem under alfalfa-corn rotations. Although soil losses during years of established alfalfa are minimal, losses can exceed allowable limits during the year of alfalfa establishment and following corn silage harvest. This recently developed system uses kura clover (Trifolium ambiguum) as a living mulch. Living mulches are plants that can be grown with a primary crop without reducing yield. 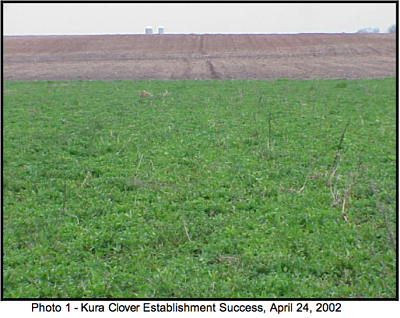 Kura clover is established one or several years prior to corn entering the rotation. In spring, prior to corn planting, the clover is herbicide suppressed enough for the corn to thrive. Best results utilize a herbicide resistant corn variety, band-killing the clover over the corn row, and suppression of the clover between the corn rows. The clover recovers by early autumn to provide ground cover for winter and spring. With adequate suppression, kura clover can be managed as a living mulch in corn with little or no reduction in corn silage or grain yield. 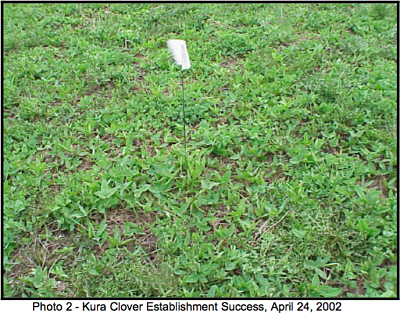 Kura clover will recover for full production for pasture, silage or hay the following season. 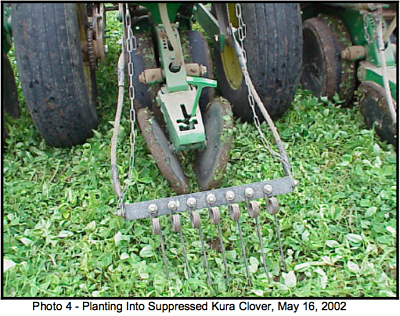 Kura clover regrows and spreads rapidly from rhizomes (i.e. underground stems), survives harsh winters, makes excellent feed and yields about 80% of a good alfalfa crop. The purpose of this demonstration was to illustrate for local growers the specifics of establishing and intercropping kura clover as a living mulch with corn. Initial soil test levels were 185 ppm P/acre; 400 ppm K/acre. Balan 60DF (2.5 lbs/acre) was preplant-incorporated the first week of May, 2001. Kura clover was then direct seeded with a Brillion seeder at 8 lbs/acre. Rhizobia specific to kura clover was seed applied just prior to sowing. Roundup Original (1 qt/acre), Clarity (1 oz/acre) and 0.5% ammonium sulfate surfactant were applied for kura clover suppression on May 3rd, 2002. Kura clover plant height was approximately 4-5”. Herbicide resistant Liberty Link corn (NK 3030 Bt) was planted May 16th, 2002 with 100 lbs/acre of 10-0-30 starter fertilizer. Hornet (4 oz/acre or 1.3 oz/acre in a 10” band), Banvel (8 oz/acre or 2.6 oz/acre in a 10” band) and 0.25% ammonium sulfate surfactant were band applied on May 17th, 2002 to kill the kura clover over the row. Had equipment been available, this application could have been applied from the planter. Liberty (28 oz/acre) and 0.5% ammonium sulfate surfactant were applied on May 24th, 2002 to provide additional kura clover suppression between corn rows. Kura clover plant height was 6-7”. Urea (90 lbs N/acre) was broadcast on May 25th, 2002. Liberty (28 oz/acre) and 0.5% ammonium sulfate surfactant were again applied on June 24th, 2002 for annual weed control and additional kura clover suppression. Given heavy rains in late May and early June, liquid 28% nitrogen (60 lbs N/acre) was sidedressed on June 26th, 2002. Kura clover established two years or more before intercropping should supply adequate nitrogen to meet the needs of the corn crop. Supplemental nitrogen in this demonstration was provided to insure nitrogen adequacy. Kura clover was successfully established (photos 1-3). Clipping of weed escapes was not necessary but might be in some situations during the establishment year. 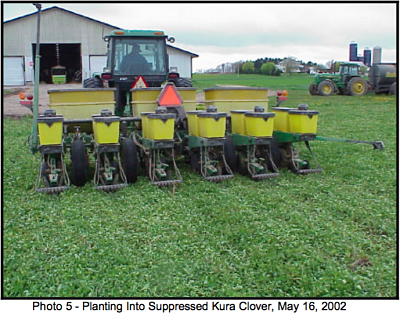 The first suppression treatment was initially adequate stunting the clover to allow for ease of planting (photos 4-5). 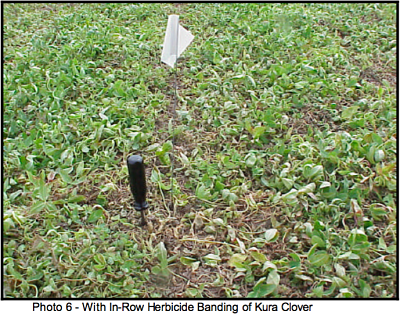 The banding treatment successfully killed the clover over the row (photo 6). Had the second suppression treatment not been applied, between-row kura clover growth would have been excessive (photo 7). 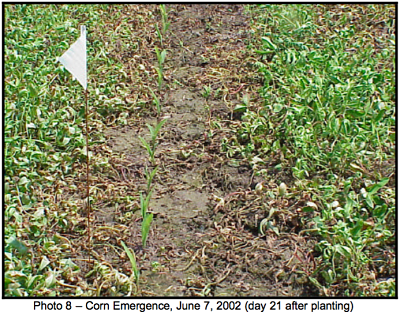 Corn emerged without difficulty with stand populations of 32,000 plants/acre on June 11th, 2002. 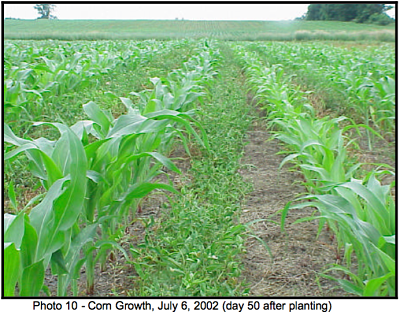 Corn growth was well established reaching growth stage V6 by July 6th, 2002 (day 50 after planting). Annual weed control and additional kura clover suppression provided by the June 24th, 2002 treatment were adequate. 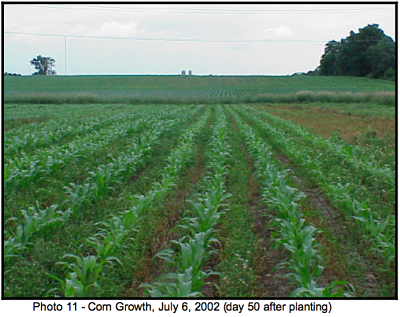 Results from this demonstration illustrate the feasibility of intercropping corn with kura clover. Although additional research continues, the merits of the kura clover living mulch system deserve consideration as an erosion protection tool. Albrecht, K.A., R.A. Zemenchik, C.M. Boerboom and P. Pedersen. 1999. Living Mulches for Sustainable Farming in the Upper Mississippi Valley. North Central Regional Research Committee Proceedings: 1-6. Albrecht, K.A., R.A. Zemenchik and B.W. Kim. 1998. 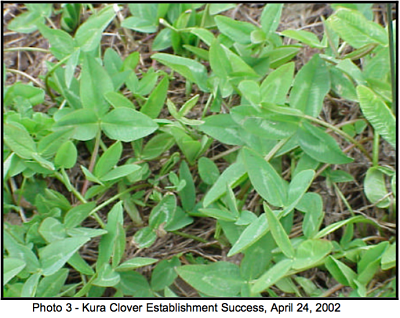 Kura Clover: The Persistent Forage Legume. Wisconsin Forage Council Proceedings: 50-52. Experiences with Kura Clover in Agricultural Systems in Wisconsin by Ken Albrecht Introduction Long term-experiments in Wisconsin and Minnesota have demonstrated that kura clover will persist for 20 years (and counting) and can be a truly permanent component of a pasture or hayfield. It has survived winters that damaged adjacent alfalfa and red clover fields. It is the last plant to die around water tanks or mineral feeders in pastures. 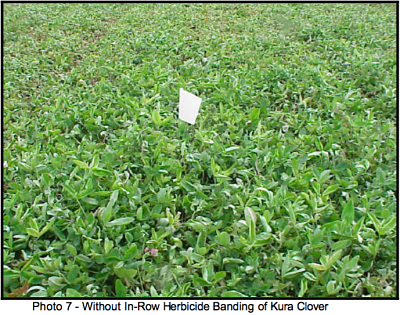 Fatal diseases of kura clover have not been observed.